By far the quickest way to travel from Kuala Lumpur city centre (KL Sentral) to KUL Airport is to take the high-speed KLIA Express Train to either Kuala Lumpur International Airport Terminal 1 (KLIA) or Kuala Lumpur International Airport Terminal 2 (KLIA2). How long is the journey from KL Sentral to Kaula Lumpur Airport by Train? 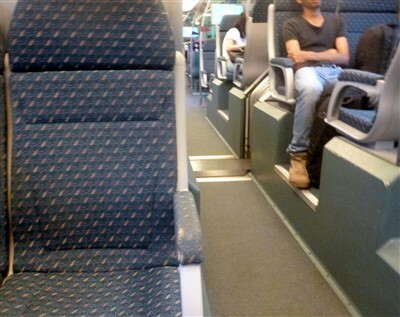 This service is a non-stop express train, with the duration of the trip from KL to the airport (main International Terminal 1) at just 28 minutes. The train then waits for 2 minutes to disembark passengers, then continues on to KLIA2, taking just another 3 minutes to get there. So if you want to travel by train from KL Sentral to KLIA2, the duration of the journey is a total of 33 minutes. Express Trains depart from the early morning with the first train to Kuala Lumpur Airport at 5:00 am and the last train at 00:40 am. If you are travelling to KL Sentral, you will never have to wait long for a connecting service to the airport, with four departures an hour during peak times of day (except Saturday) and three departures at other times. Please note: On Saturday's there is a slightly different train schedule, with the KLIA Ekspres departing every 20 minutes throughout the day from 05:00 until 23:40, then the last two trains depart as per the above schedule. Infants aged below 2 travel for free. Return tickets valid for one month are available for 100 MYR Adult / 45 MYR Child. You may be able to get a discount on the above fares if you book online direct from the KLIA Ekspres official website (see link below). You can purchase your tickets for the KLIA Ekspres at their ticket counters at KL Sentral Station or from self-service kiosks. To find the departure point / ticket counters, just follow the overhead signs at the station.